Witches, bats and ghosts...oh my! It must be time for Halloween. Create one-of-a-kind favors, treats or Halloween beads with our free Halloween printable designs. Print these cute labels at home to create your own unique party favors. Our Halloween designs are pictured below on cupcakes, party beads and gift tags, but the possibilities are endless. Use the designs on paper cups, water bottles or labels. 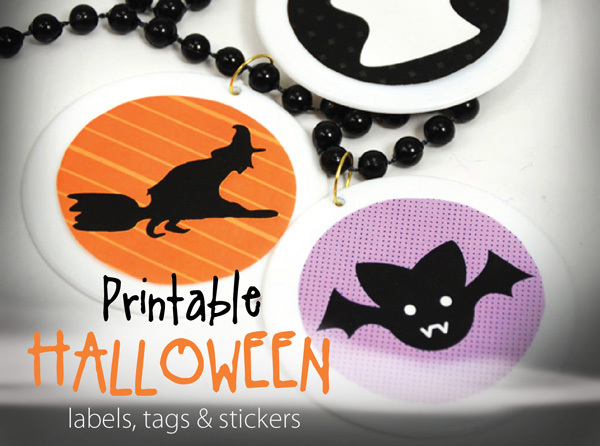 Download the free printables by clicking the links (above or at the bottom of the post) to PDF files with our exclusive bat, ghost and flying witch designs in round or rectangular tags. Print these designs onto 8 1/2 x 11 inch card-stock or sticker paper to create your unique party goods. Print the round designs on sticker paper. Use a 2-inch craft circle cutter or scissors to cut out each circle. Stick two stickers back to back over a toothpick to make these cute, spooky cupcake toppers. These Halloween beads make great party favors or special treats to hand out to trick-or-treaters instead of candy! To create these Halloween beads, round stickers are added to plain blank discs that hang on strands of black beads. These blank discs are available in a variety of colors and bead styles. 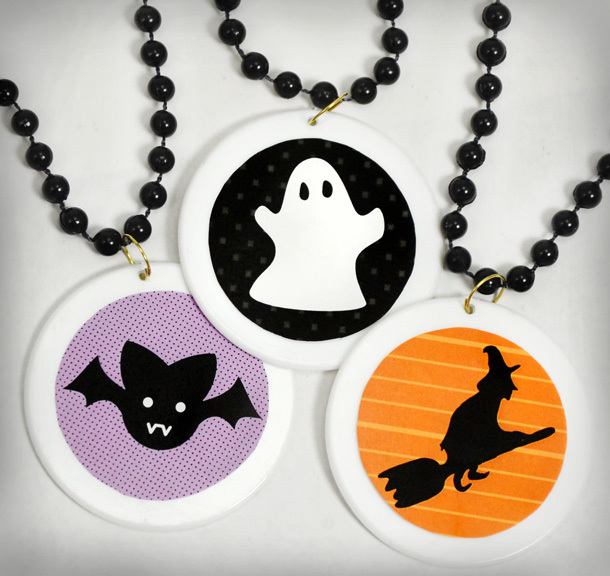 Simply add your design to the disc for easy, inexpensive custom Halloween beads. For styles and colors of blank disc beads, click here. Attach the rectangular tags with ribbon to bagged candy, party favors and gifts. Use a hole punch at the top of the rectangular tags and thread each with black ribbon or twine. Download the free printables by clicking the links below. You will need a PDF reader to open the file. We have even more Free Printables! Check out our turkey, fall leaf and pumpkin graphics. Thank you for these free tags and circle tags - greatly appreciated! Perfection! Thanks for sharing these tags (and all the other holiday versions) I love that I can edit them to personalize. They are exactly what I have been searching for! Thanks for the comment Cidne. We would love to see how you use them!